Bloomsbury Children's Books, 9781681195216, 192pp. 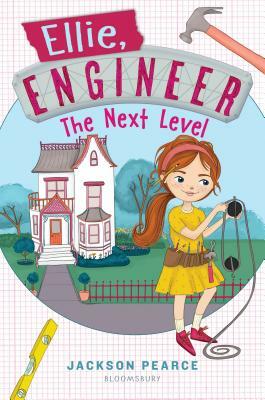 Ellie the Engineer is back in another charming, hilarious, illustrated story filled with creative, STEM-powered fun! After Ellie's first elevator build goes terribly wrong, her parents decide her "punishment" is to assist an elderly neighbor, Mrs. Curran, around the house. Ellie and her friends Kit and Toby are really only supposed to help with little things, but Ellie can't turn down the opportunity to use her engineering skills here and there where she sees a need--because that's what engineers do! It's no fun, though, when Mrs. Curran always gives Toby the credit for all the ingenious projects, and acts like Kit and Ellie were just helping him. . . . Can Ellie come up with another great build to elevate Mrs. Curran's ideas about this girl engineer? With Ellie's designs and sketches throughout, and her fun guide to simple machines in the back, the continuation of this delightful series will leave young readers laughing and inspired to create. Jackson Pearce lives in Atlanta, Georgia. She is the author of a series of teen retold fairy-tales, including Sisters Red, Sweetly, Fathomless, and Cold Spell, as well as two stand-alones, As You Wish and Purity. As J. Nelle Patrick, she is the author of Tsarina. In addition to The Doublecross and The Inside Job, her middle grade novels include Pip Bartlett's Guide to Magical Creatures, co-written with Maggie Stiefvater.